Looking at the greatness of emperumAn, when AzhwAr tried to move away from him thinking that he is unsuitable to be with emperumAn, emperumAn removed that thought from AzhwAr and made him to praise him again. After seeing this ability, AzhwAr wonders “For you who won over me and made me unite with you, is winning over rAvaNa a great deed?” In the interpretation where AzhwAr said a few words in frustration after being unable to see emperumAn directly, we can consider that emperumAn showed his form of ruling all the universe and his activity of destroying the demon, thus bringing clarity in AzhwAr and removing his frustration. nin valiyE – is it any great skill (for you)? nAzhAl amar muyanRa vallarakkan innuyirai vAzhA vagai validhal nin valiyE – due to his arrogance that he is the king of all demons, rAvaNa, ignorant of the fact that he should not stand in fight with SrI rAma, waged a war with him. 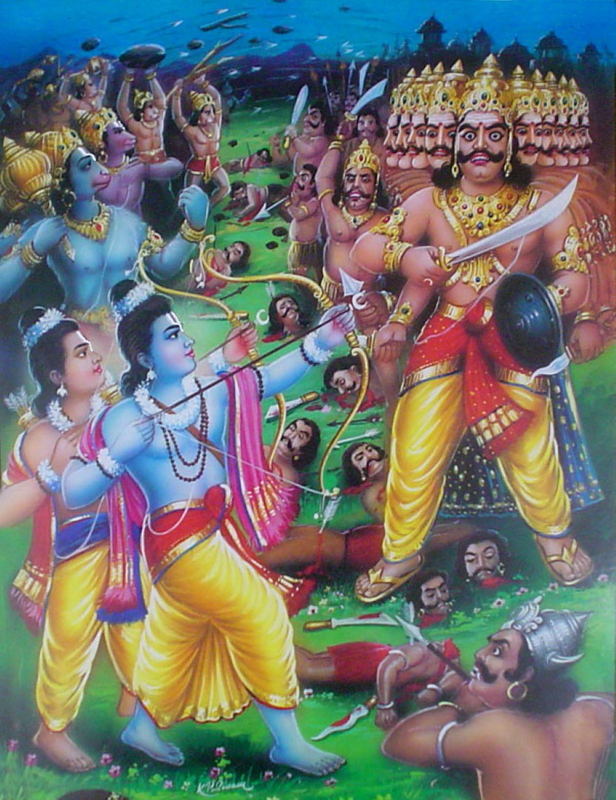 SrI rAma destroyed him in such a way that he lost his dear life. AzhwAr is asking whether this is such a great ability for emperumAn. The opinion here is that for emperumAn who was able to win over AzhwAr who was about to leave his presence considering himself to be unsuitable to be with emperumAn, the act of destruction of rAvaNa does not appear to be a patch on the former act. Thus it is clear that those who move away from emperumAn considering themselves to be ‘unsuitable’ will be on a par with rAvaNa who separated sIthAppirAtti from emperumAn. AzhAdha pArum nI vAnum nI kAlum nI thIyum nI nIrum nI Ay ninRa nI – Contrasting elements such as soil [earth] which will dissolve in water, water which will put out fire etc are all emperumAn’s wealth. You are the indwelling soul for all these five elements which are your wealth. You unite all these elements and rule over them. For a person with such great ability (to put together contrasting entities) is making me appropriate for you such a great skilful act? For you who are the antharyAmi for these elements, who are their controller and who are referred to by any word which refers to any of these five elements, is making us, who are under your control and who cannot sustain ourselves if we do not attain you, suitable for you, such a great deed? We can also consider this to mean that just as killing rAvaNa is not a great deed, making us appropriate for you is also not a great deed. We will move on to the 12th pAsuram next. This entry was posted in iyaRpA, periya thiruvandhAdhi on October 17, 2018 by T N Krishnan.